As BCV’s work at Joseph Phelps Vineyards nears completion, it is with great sadness that we acknowledge the passing of the winery’s founder, whose review we very much looked forward to: Joe Phelps, who died on April 15 at his home overlooking the winery site in Saint Helena. Joseph Phelps Vineyards is a family owned and operated business that consistently produces some of Napa Valley’s finest wines. BCV has had the great privilege of working for Bill Phelps and the other members of the second generation to transform architect John Marsh Davis’s landmark winery building into a new tasting and hospitality center worthy of the brand. Over 14,000 square feet of tasting, office, kitchen, and event space was inserted into the original tank room barn in a way that both honors and extends Davis’s Wood Expressionism. The arrival sequence and exterior grounds have been reimagined to celebrate the building’s architecture and site overlooking Spring Valley. Bill Phelps, president of the winery, has been an amazing client – both in his understanding of the winery’s history and his vision for what it continues to become. Bill took over operations ten years ago, and I greatly admired how he made the renovation project his own, while continuing to involve his father in the design process. It was clear from my meetings with Joe that he took great delight in the building – and in making things – which leads me to the title of this post. Joe’s biography always begins with his work as a contractor prior to his winemaking days (although he did tell me that his first exposure to wine came in college), but the narrative quickly leaves this part of life behind. My sense of him is that he was a man who loved all aspects of building. From design to how things are put together, he had a way of inspiring his architects (Davis, Ron Nunn, Don Brandenburger, and now us) to push further and create the teams to make a project work. All of these traits are evident in the organization he created at Joseph Phelps. We mourn the passing of this great builder of structures, wines, and businesses. 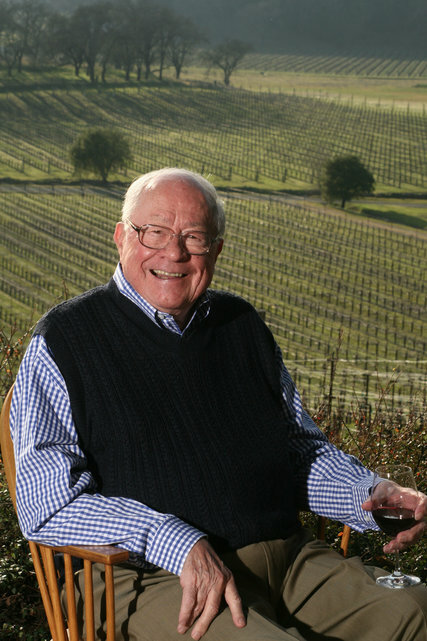 His Insignia wine may justly be more famous than the River Ranch Farmworker Housing Center for which he donated the land, and engaged Don Brandenburger in pro-bono design services. But he uniquely understood how they are all connected and he is succeeded by children, grandchildren, and great-grandchildren who carry on the tradition.